Cheshire is a green and pleasant county, complete with wonderful ye olde Tudor buildings and Friesian cows chewing the cud in calm pastures. The loveliness attracts people who can afford to live in places purely for the loveliness, so the fields are dotted with walled manor houses both ancient, modern and faux-ancient. The best places to stay in Cheshire are similarly varied. Much of Cheshire's appeal is centred round the historic Roman town of Chester, with its red Roman wall and ancient collection of architecture. 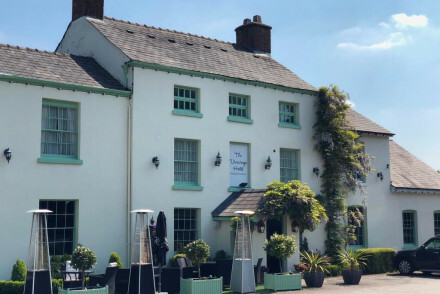 Football millionaires, celebrities and even royalty are attracted by Cheshire's rural idyll, so you never know who you're going to rub shoulders with in one of the pretty local villages. Most people come to Cheshire for Chester. As well as Chester's wall there is also a Roman amphitheatre and gardens and some wonderful Tudor and Victorian buildings. 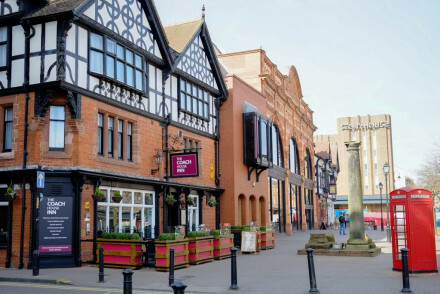 Chester also has Cheshire's best shopping in one of the country's prettiest town centres. 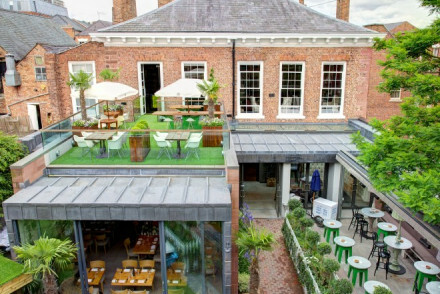 If you appreciate a quirkier architectural style Knutsford might be one of the best places to stay in Cheshire for you. A wealthy former resident with a penchant for Mediterranean architecture commissioned a whole lot of weird and wonderful buildings. For the best of these head to King Street. Visit Chester's historic Roman amphitheatre and gardens. Spend an afternoon exploring Lyme Hall (the set of Pride and Prejudice). Walk along Alderley Edge and enjoy beautiful views of the Cheshire plain. With so many different areas to explore you are spoilt for choice for the best places to stay in Cheshire. The Chester Grosvenor is often referred to as 'one of the finest hotels in the north-west'. Its restaurant, The Arkle, has retained its Michelin star for two decades. ABode Chester occupies a building which used to be the Cheshire Police HQ, and the entire fifth floor is Michael Caine's restaurant. Oddfellows is a quirky hotel well located for Chester's charms. There are round beds, boutique furnishings, a Michelin starred chef and a fabulous potting shed bar in the secret garden. 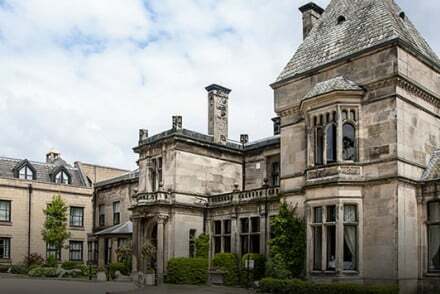 Built in 1816 Rookery Hall Hotel and Spa is a wonderful mansion set in 38 acres of lovely parklands. The interior has been renovated to meet the needs of the choosiest visitors - they even have television in the bathrooms and a glass roofed indoor pool. A charming Georgian house with a boutique feel. Edgar House features gorgeous feature baths and picturesque gardens. The nearest airports to Cheshire are Manchester International and Liverpool John Lennon, which are both about 40 minutes by road. Travel to Chester by train just two hours from London. Best time to visit - Chester is a year round destination with each season bringing its own charm but for the best chance of warm bright days visit in the summer months of May - August. 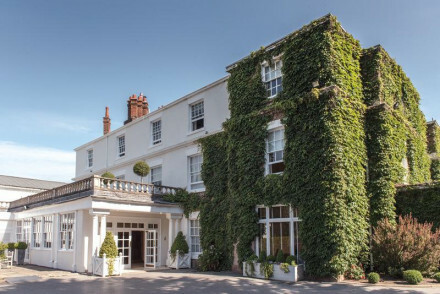 Browse through our list of all the best places to stay in Cheshire. 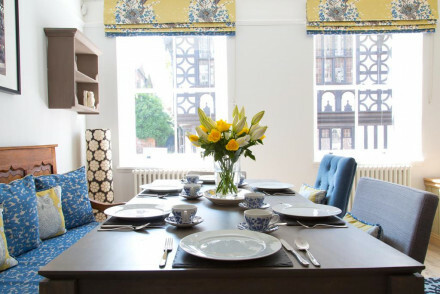 Consult our list of the best places to stay in Chester. This Restaurant with Rooms is worth a visit for dining alone. The individually designed boutique rooms are spacious and luxurious with bespoke furnishings made locally and egyptian cotton linen. Located in a great spot for exploring the area. The restaurant, of course, is excellent. Sights nearby - Visit Chester and see the spectacular Castle and Cathedral. Great walks - There are walking trails in the surrounding countryside. After recently undergoing a significant renovation, The Bear's Paw blends modern comforts with its traditional 19th century heritage. Open fires, wooden panelling, excellent restaurant and antique oak floors are all features that give the inn a welcoming, homely feel. Local exploring - A great base for exploring the delightful village of Warmingham and the surrounding Cheshire countryside. Sights nearby - Visit the magnificent nearby Beeston Castle. Local markets - Browse the wares at Sandbach Market. A historic inn boasting a fantastic location in the heart of the city. Having undergone a successful renovation the interiors perfectly mix traditional and contemporary styles giving a warm yet unfussy feel. Hearty meals are served in the restaurant and most of the city's attractions are nearby. Local exploring - Boasting a fabulous location in the heart of the city’s new cultural district. Great walks - Get out of the city and take long walks along the scenic Wales Coastal Path. Sights nearby - Marvel at the architecture of the majestic medieval Chester Cathedral. 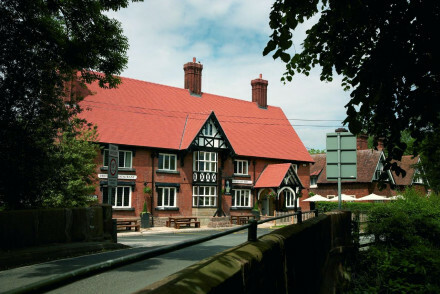 Nestled in a peaceful corner of Cheshire, The Pheasant Inn is a delightful establishment. 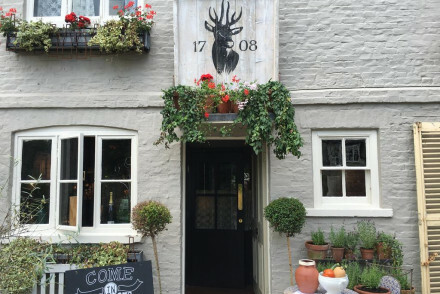 Awash with rustic charm, the inn features a cosy pub, a delicious game-based menu in the restaurant and excellent rooms. A great place for a relaxing weekend away. Sights nearby - Cheshire is castle country so take trips to Beeston Castle and Holt Castle. 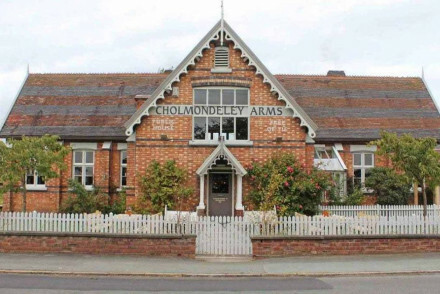 Set in a beautiful Victorian schoolhouse, The Cholmondeley Arms is full of charm and character. At the heart of the inn is its pub where excellent food is served in the restaurant and a wealth of drinking options in the bar makes for a great place to relax. Local exploring - A great base for exploring the charms of Cheshire. Sights nearby - Pay a visit to wonderful The Cholmondeley Castle Gardens. Great walks - Explore the nearby Sandstone Trail Walk. A charming boutique hotel set in an elegant Georgian house in the heart of the city. Three beautifully styled rooms feature antique writing desks, William Morris print quilts and wonderfully indulgent bathrooms. Expect home made cookies and freshly cut flowers too. Local exploring - A centrally located B&B ideally situated to access Chester's main attractions. Great walks - Take a wander down to the river Dee, the ancient hub of the city. Sights nearby - Make a trip to the majestic Chester Cathedral. A quirky hotel well positioned for sightseeing in Chester. An eclectic mix of decoration throughout cosy suites and apartments; round beds, boutique furnishings, mezzanine levels, and all the mod cons. Michelin star chef, Mediterranean fare, and a trendy rooftop bar in the garden. Pretty cool! Bar - Fabulous potting shed bar in the secret garden. Foodies - Michelin star chef. 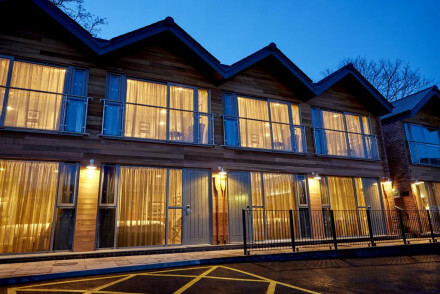 Country house hotel with modern add ons in the heart of Cheshire nestled amid 38 acres of grounds. Award winning spa with large glass roofed pool, sauna, steam rooms and much more. Excellent food. A charming pub set in the heart of Chester boasting 21 chic riverside rooms. The restaurant serves up traditional hearty pub fare alongside a choice selection of ales. The rooms, in contrast, are contemporary with floor to ceiling windows, nautical themed wallpaper and luxurious bathrooms. 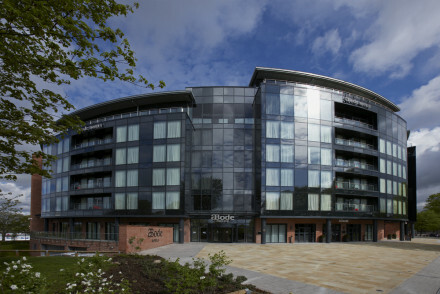 Local exploring - A chic hotel boasting an enviable location in the centre of the city set alongside the river. Great walks - Enjoy a scenic stroll around the famous Chester walls. Sights nearby - Stop by the impressive Chester Cathedral. 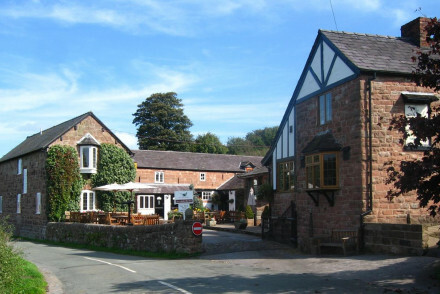 Charming 17th Century Grade II listed hotel and pub. 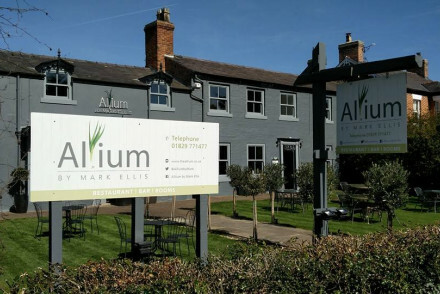 Boasting an award-wining restaurant which uses mostly locally sourced produce. Offering a range of in-house entertainment from games room to library. Decor is traditional and cosy. Perfect for a comfortable country retreat. A grand country house located in a secluded rural setting yet just a short distance from Chester. Elegantly styled throughout. Expect a choice selection of antiques, rich fabrics, fireplaces and traditional art. A spoiling spa, superb restaurant and family-run ethic makes this a special stay. Total relaxation - A quiet location, relaxed service and spoiling spa makes this the perfect spot for a rejuvenating weekend getaway. Sights nearby - Marvel at the medieval architecture of Chester Cathedral. A boutique bistro with rooms filled with charm and character. Individually styled rooms with a French feel, mixed patterns, rich colours and antiques. A European inspired menu is well executed and the portions are reassuringly hearty. A romantic spot for a weekend getaway. Country Escape - Easyily accessible from Manchester and surrounded by beautiful countryside The Roebuck is ideal for weekend escapes. Sights nearby - Visit the National Trust sites of Tatton Park, Dunham Massey, Alderley Edge and Quarry Bank. A lovely Georgian house overlooking the River Dee with clean, contemporary interiors and stylish bedrooms. Lovely feature baths and views of the river and garden. Boasts a mini cinema, library and sitting room. 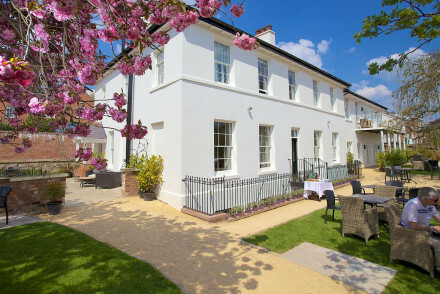 Enjoy English afternoon tea at this stylish guest house hotel. Strikingly modern property with 84 well equipped bedrooms converted from Chester Constabulary's former HQ, right next to the racecourse. Brasserie Abode Bar for dining and drinks, which occupies the entire 5th floor and features a rooftop terrace with great views! 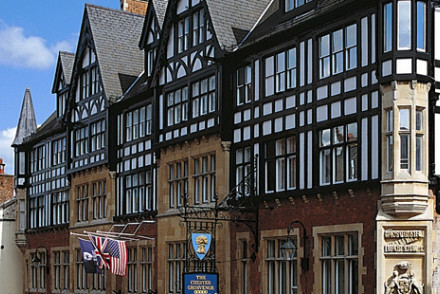 Traditional luxury hotel in Chester town centre. Elegant modern interiors. Restaurant with 20 years of Michelin Stars, bars, spa and gym.